One Of The CherokeeBurial Mounds Realtor Maria Sebastian Saw Two Days Ago On Rural Property Is Now An Empty Hole In The Ground - Oh My Gosh! "...an enticing tale of shady real estate deals and Mafia crimes... faced-paced and sometimes hilarious action. "-Elaine Orr, author of the Jolie Gentil Cozy Mystery Series and numerous other mysteries. Maria Sebastian, Realtor, knows where a grave has been emptied. A body is found in the Chattahoochee River. She's going to lose the buyer if she can't convince authorities the two are tied together, as well as the commission that goes with him. Proving what she knows stirs up a murderer or two, a madman, an ancient secret, a bunch of old people and a wacky cousin complete with a Guatamalan/Spanish/Italian speaking bird. People come and go through the revolving door called her house, including her boyfriend. Each with his own secret "An entertaining mystery featuring Maria Sebastian, a real estate agent who tackles wooded property, wild relatives, and a boyfriend who's never there when she needs him... when she finds some old Indian graves in the woods, it gets downright dangerous. "-Cheryl B. Dale Dale, author of Taxed to the Max , Treacherous Beauties, The Man in the Boat, Set Up, Warwicks of Slumber Mountain, and Intimate Portraits. "With wonderful descriptions of small-town Georgia, Melody Scott weaves a wickedly good tale. 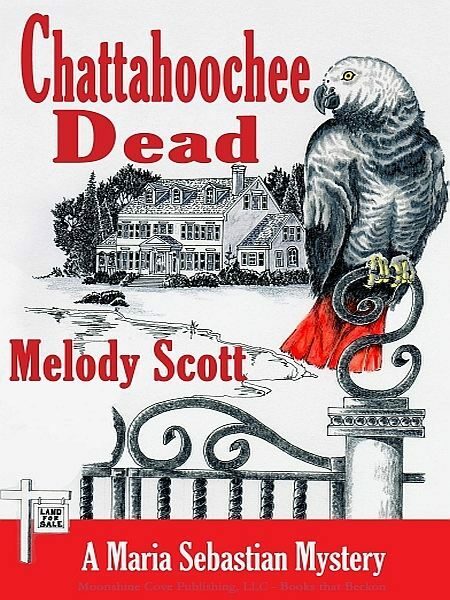 Chattahoochee Dead will keep you turning pages until the very end.-Renee Pawlish, author of Reel Estate Rip-Off, This Doesn't Happen In The Movies, Elvis And the Sports Card Cheat and The Malt.